York, PA – November 2017… With its goal of following in the Spirit of God and the footsteps of Jesus, St. Paul's Wolf's ECC (Evangelical Covenant Church) gathers to enable and equip people to impact lives for Christ. Offering programs for adults, youth, children, involvement in a food bank, as well as a program to help the homeless, the church has numerous opportunities for its members to get involved. 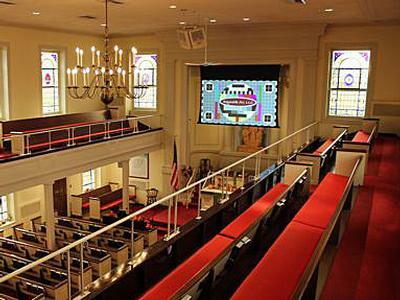 St. Paul's Wolf's recently completed a substantial overhaul of its AV infrastructure, which in addition to a new sound reinforcement system also included new projection capability. On the video side of the equation, the church is now equipped with projection technology drawn from the catalog of Rancho Santa Margarita, CA-based Eiki International, Inc.
For information about St. Paul's Wolf's ECC, go to www.wolfschurch.org. To learn more about Reynolds AV, visit the company online at www.reynoldsav.com.